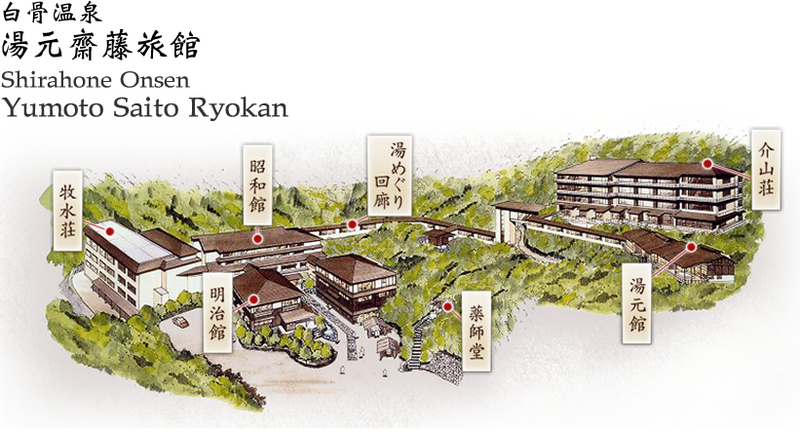 Set in a scenic forested gorge, Yumoto Saito Ryokan puts your visit to Shirahone Onsen in the tranquility of the natural surroundings in accommodation traditionally styled for your restful stay in a refreshing retreat to wellness of restoring and rejuvenating in natural hot spring (onsen ) drained from the Ryokan’s own fountainheads. Yumoto Saito Ryokan offers 51 rooms including Grand Rooms, Superior Rooms and Exclusive Rooms, designed and furnished to confer pleasant ambience, with interior featuring traditional Japanese Washitsu from aromatic Igusa -made tatami flooring to Shoji screen windows and Fusuma dividers, and some with Western bedding. The Rooms are located within 3 buildings set in naturally beautiful surroundings. which stood at the river side, offering scenic view of gushing Yu River cascading down below the gorge and the dramatic hill slopes. It is named after a Japanese poet who stayed at the Ryokan before. You may distantly hear flow of the river from Bokusui-sou Rooms. which is in the main building, commanding a grand photogenic view of the gorge and majestic mountains. All Grand Rooms in Showa-kan including one Accessible Room are non-smoking rooms. Kaizan-sou features 3 types of Rooms - Standard Rooms, Superior Rooms and Exclusive Rooms. In the Superior Rooms and Exclusive Rooms, bathing is complemented with views over the surrounding landscape unfolding to the ceiling-high window set in front of the bathtub filled with heated natural spring water (*not onsen). Yumoto-kan features 2 large public bathhouses, each has an indoor bath and an outdoor bath under roof covering, and shower facilities. Oniga-joh , landscaped with volcanic rocks from Norikura Highlands and enclosed with bamboo fencing, offers bathing at the outside with no roof covering and no shower, a traditional Japanese bathing experience of soaking in the onsen and contemplating nature in the open air. All public bathhouses in Yumoto-kan and Oniga-joh are gender-segregated and switched every mid-night. 2. In consideration of our other guests, we do not permit any guests with tattoos using the public bathhouses. Guests with tattoos may use the private bathhouse ‘Sennin-no-yu’ at a fee for which reservation is required. Azumi-no Restaurant has intimate dining area layout with Shoji screen dividers installed for added privacy and multiple dining rooms of traditional Japanese design and furniture settings, which can accommodate large party of the Ryokan guests. Dai-Bosatsu toge Banquet Hall where dining meets with traditional Japanese interior design provides a spacious venue for banquet and business functions. seasonal products which make suitable gifts for friends and families. Waiting lounge next to the Reception, where guests could relax and surf the Internet by connecting to the free Wi-Fi. Kurumi Lounge, transformed from formerly a Doma of the Ryokan owner’s residence, offers intimate reading corners and comfortable sitting area. Here, guests may surf the Internet, chat with friends, read a book from the library, or enjoy a drink at the bar that serves selected alcoholic drinks and other beverages. Dinner features Chefs' selection of Japanese local and seasonal specialties. Breakfast features the local specialties - onsen porridge and Japanese traditional dishes. The onsen porridge is said to have soothing or curative effect for gastrointestinal problems. Dinner and breakfast are included in your stay at the Ryokan. For more details about meal courses and menu options, please contact us. When contacting us for room reservation, please let us know if you have any dietary restrictions, food allergies or religious restrictions on certain food or beverages. (a) vegetarian meal; (b) Halal meal; (c) non-wheat flour contained meal; (d) some other dietary restrictions of guests. Nearby attractions are Japan Alps Kamikochi and Norikura Highlands . Please visit Kamikochi Official Website at http://www.kamikochi.or.jp/english/ for information about its opening period and travel guide. 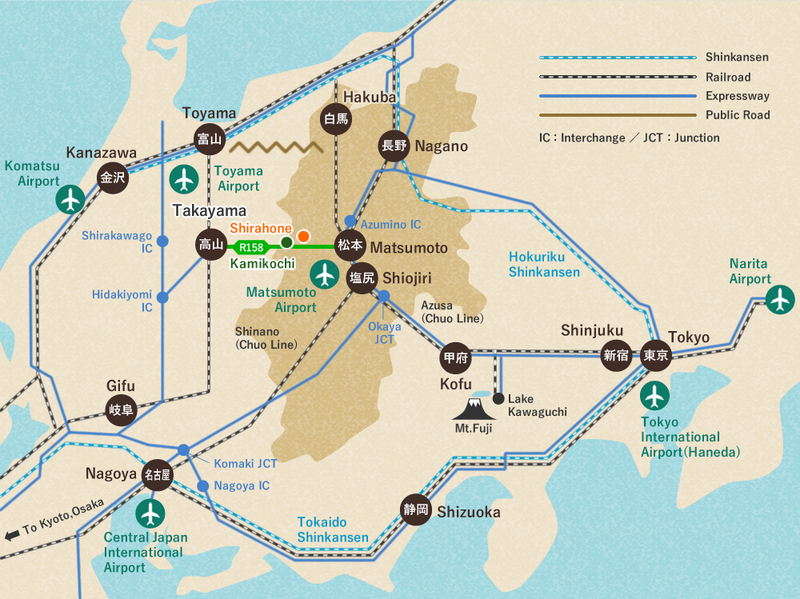 Please take note of the geographical location of Shirahone Onsen for your itinerary and schedule planning. Please note that the timetable and the frequency of the local train and bus services to Shirahone Onsen vary from season to season. Please always obtain the latest version for your itinerary planning. Those traveling by bus, please let us know your bus schedule once confirmed, we will arrange a pick up at the ‘Shirahone-Onsen’ bus stop. Those traveling by car during winter or snow season, please make sure your car is fitted with snow chains to the tires or with winter tires. Mountainous region may experience extreme weather conditions for a prolonged period in winter. Please seek proper advice from your car rental company, or contact us for information. Please contact us direct for room reservation. Please be advised that we only accept room reservation under the name of the staying guest. Any reservation made under the name of any non-staying guest will be regarded as invalid and void ad initio. To avoid any misunderstanding or inconvenience, please ensure that you give us the correct particulars and/or credentials of the staying guests for room reservation. Please note our check-in time. For arrival later than 17:00, please let us know in advance by calling or emailing us.